Dance With Me classes are 30 minute classes for children ages 2.5 until 4 and their caretaker. Parent participation is encouraged as children are introduced to the basics of dance and musicality in a nurturing and fun environment. Just $75 for 10-week Fall and Winter sessions, or $90 for the 12-week Spring session. Once your dancer is comfortable dancing on their own, we encourage them to transition into our Pre-Primary classes for children ages 3.5 – 5. Pre-Primary classes are 45 minute classes designed for children who are ready to dance independently in a more structured class environment. Dancers who are 4 and older, and have already taken a year of Dance With Me, must register for a Pre-Primary class. 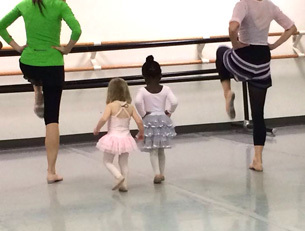 Like Dance With Me classes, Pre-Primary classes are offered in 10- and 12-week sessions. Fall and winter sessions are 10 weeks each; the spring session is 12 weeks. Class placement is at the discretion of the instructor. If you have questions about registration, please call the office at 609-514-1600 or email studiomanager@princetondance.com. As long as there is room in a class, you can join the class even if the session is already underway. The cost of the session will be prorated based on the number of classes remaining. Contact the office at studiomanager@princetondance.com for information.